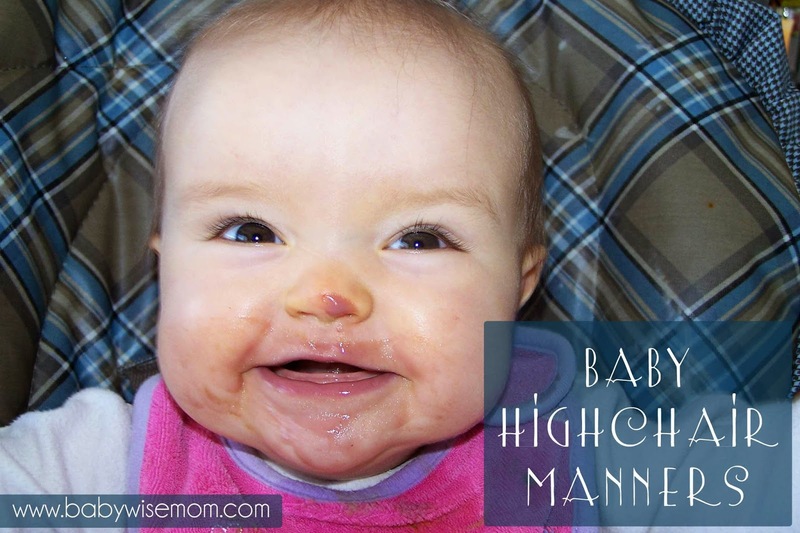 How to Teach Your Baby Highchair Manners. Tips to help baby have good manners while eating. To a new parent watching their child eat for the first time, every little thing is so cute. Raspberries, dropping toys, playing in food, etc. For me the second time around, I still find these things cute, but I also am better about seeing the long-term effects of what I allow to happen from a young age. But I am not perfect about it. Here is a story that illustrates a major blunder I made with Kaitlyn regarding toys while eating. Brayden got no toys while he was eating. He was a good, fast eater and loved food. I had fully planned on following that same path with Kaitlyn. Kaitlyn, however, was (and is) not that fond of baby food. She likes her veggies, and has grown to like her cereal, and only tolerates her fruit, but she started out just disgusted at everything other than veggies. I found if she had a toy, she was distracted and would eat. So I let her have it. She had reflux and therefore food was always a concern for me when it came to her. Then the game started. At one point, Kaitlyn started dropping her toys while eating. She then stared at them, then looked at me with big, sad eyes. She then put her hands together in front of her mouth and refused to eat another bite until I picked up the lost toy. Once I gave it to her, she would eat again (that is, until she dropped it, which often took less than one second). At first I thought it could only possibly last a week until she tired of the game. Nope. It was still a huge hit after a month. I was so tired of the game! SO TIRED! And I did it to myself. Oh how silly. One weekend, I had had it with the game. So Monday, after breakfast, she got no toys. I just stopped it right there and told her no more toys, She ate just fine, and ate well without them. She ate faster. She would sometimes look at me with this look. I knew what she was asking for. I told her no more toys while she was eating. She was fine. She accepted it with no fits or food strikes. With Brayden, he didn’t get toys while I was feeding him. Once the meal was over and I needed him in the highchair still for cleaning up, cooking, eating, or whatever, he could have them. I find that to be just fine. I moved that way for Kaitlyn, though at this age she usually wants some bread, bananas, and cheese after she is done with the yucky baby food. So I think toys in the high chair are just fine if you aren’t feeding them. I tell this story to illustrate that you have to be careful what you allow. However, if you have allowed things in the past, it doesn’t mean you are stuck forever. You can make mistakes and correct them. For things like raspberries and spitting, I just have to do my “that’s a no” coupled with my mommy glare (the look moms give when you have done something wrong). Then consistency. You never allow it. They will get it. Babies don’t want to do things they shouldn’t. They look to you for guidance on what they should or should not be doing. Yes, they test, but once they see the rule is the same, they happily comply. That is the reason I also do not laugh or smile when they do something they shouldn’t, even when it is really cute. When I really must laugh and smile, which does happen of course, I turn my head, cover my mouth, and even leave the room. One giggle from you and baby will be working hard to repeat your reaction. They love to please. So show your pleasure when they are behaving as they should. There are things babies like and need to do to explore and learn. That is totally fine. The problem with Kaitlyn’s toy dropping was not that she did it, but when she did it. It was interfering with mealtime. She still loves to drop it and watch where it lands and have me pick it up for her, but we do it during playtime, not mealtime. It is like an example used in Toddlerwise of a baby playing in the dog’s water. Playing in water isn’t a bad thing, and it is fun for the baby, but the dog’s water is gross (even if you keep it perfectly clean, that is gross). So you let baby splash in the tub, or take baby to a water-safe place and give him a bowl of clean, non-dog drool water to splash in. I find that babies are smart enough to make the distinction for when and where okay and when and where it isn’t. Naturally, you have to apply this age-appropriately and developmentally appropriately with each child. and as a mom of older kids 5&6 both being raised BW, you find that “bad habits” get picked up at school or other places (friends houses)things that aren’t acceptable in your house. With them raised knowing that mom and dad are the “boss”, giving them a small talk to help them understand why this is not ok is simple and easy, and because they are desiring to please you and to do what is right they have the self control needed to stop the behavior. they key is they have the skills needed to control the behavior. Sorry this question is off topic with your post, but I’m a new mom with a babywise question. We’ve been following babywise principles for several weeks now and I’m seeing progress. Our boy now goes down for almost all naps without a fuss and seems content and happy. My question is the night. He eats around 8:00 and goes to bed around 9:30ish. I’ve been waking him up for a dream feed around 11:00 in hopes that he’ll sleep through the night, but he seems to be waking between 4:30 and 5:00 every mornign. We’ve been letting him cry and he’ll fall asleep for maybe 20 minutes and is then up again. Do you have any thoughts or options on what I should do. Is he just hungry and I need to feed him (he eats around 27 ounces during the day- he is about 14.5 lbs. and is around 10 weeks old..he was born big at 10.5). Should I keep the dream feed or drop it??? Thanks for the help and for all the great posts. Thanks Leanna! That is the reason I kind of dread school days :). When my son went to nursery at church, he picked up on things I was not happy with. But it is part of life, you can’t just lock them up! You make a good point to teach them well before they get outside influences. Becky,Remember that 15% of BW babies don’t start sleeping 7-8 hours until they are 10-12 weeks old. I would wait until he is 12 weeks before doing CIO at night, just to see if he will do it on his own. This is unless you are sure he is ready for it now–I have a friend who did it at 9 weeks successfully–but you don’t sound sure :). If he is waking up soon after falling asleep, I would assume he is hungry. I knew my daughter no longer needed that feeding when she didn’t eat breakfast well. If he is still eating well at his first feed, he probably needs it. Good luck! Thanks that’s helpful. I think we’ll both be happier if I stick with the feeding for now and see if he progresses their naturally in the next few weeks. 🙂 I’ll watch those morning feedings too. I’m off subject, too. But wondering if you have an RSS feed to your blog. Am I just missing it? I can now get the Growing Kids in my email & LOVE that, and would love to get your tips in my email. I have been sending new Babywise Mom’s to your blog or using yours to remember things I did at six weeks because my son is now 14 months. Thanks for writing this blog. If you are on the main page (http://babywisemom.blogspot.com/) and scroll all the way to the bottom, you will see Subscribe to: Posts (Atom) . It then pulls up a page and you can subscribe to feeds. I am not sure exactly what happens when you do that, but you can give that a try. I don’t think it emails you every time I do a new post, though. I do a new post every day (other than some Sundays and then the random day I don’t get time 🙂 ). Perhaps I could collect email addresses and just send out an email letting everyone who wants to know when I put a new post up? What a helpful site! Thank you for taking the time to put together this resource. I just discovered it today but will be checking it regularly from now on.My son will be 7 months old next week, and just yesterday started blowing raspberries when the spoon goes in his mouth at meals. My husband and I are not sure how to respond to this. At what point can we work with him, and what are some strategies you would suggest? I’ve tried placing my fingers over his mouth and saying “No blowing” and then stopping feeding him for a couple of minutes. This morning when I did it, he kept making his raspberries even with my fingers on his lips. Maybe it’s just too early? What do you recommend? Glad you found us! I would definitely say he is old enough to start working with him. I think your strategy is a good one. It might take some time and patience. I would follow the stategies outlined in this post and work toward it. You could even add removing him from the him from the highchair for a few minutes when he does it. My LO who is almost 7 months, loves to blow raspberries. He does it all the time, so it’s natural that he does it while eating solids. I tell him no every time, but he hasn’t quite gotten it yet. I think it’s because he’s bored. He start out fine, but after a couple bites of food, he starts. Any ideas for making him more interested in his foods? If it’s a food he loves, he doesn’t do it. I would praise him for his good bites, tell him no when he raspberries. I would also talk to him and perhaps sing songs to him. Keep him distracted from blowing raspberries. my 15 month old has been refusing to sit in her highchair for the past few days. She kicks and screams, and if I manage to get her in it, she refuses to eat. She has been sick with a stomach virus for 10 days, so she has been eating very little anyway. If i sit her in my lap she will eat some, but is she too old/big for a highchair, or is this just disobedience? Thanks! My son is 16 months old and during mealtimes he seems to eat very quickly or else doesn’t eat much at all (even at breakfast). He’s also started to intentionally drop food off his tray despite my reprimands and continually says ‘down’ wanting to get out of his highchair. When he’s finished eating, I get him to sit in his highchair and read his books for a bit of self control. He is such a busy child and never stops moving!Should I just try to feed him as quickly as I can then let him down? And what do you think of him having toys on his highchair tray? Sometimes this is the only way he will eat – if he has a toy with him. Any other suggestions?Also, you wrote a post once stating that you do not smack your kids – can you please send me the link for this? Many thanks. Maria–My daughter is 18 months and does the exact same thing. She used to be content with the highchair, but now wants down as soon as she is done eating. I have found this to be a problem when we go to restaurants b/c now she wants down and there is no place for her to go while we are there! So, at lunchtime, I have been setting the timer for 1 hour (about the amount of time she would have to sit in a restaurant) and for the 1st 30 minutes she sits and plays/reads, then the second thirty minutes she eats. She knows she cannot get down until she hears the timer. Hope this helps! Christie, I am sorry I missed your comment way back in October! Maria, It is pretty common for toddlers to seem to eat nothing. BW II says that you can expect about a tsp. per food item to be eaten (of course, this would depend on how many food items you offer, and they don’t elaborate more). But a tsp. isn’t a lot. They especially don’t eat much while teething.I think the reading books in the highchair is a good idea. You can use that as structured playtime. Or you can let him choose from a list of activities suitable for the high chair and have it be free playtime. He might color or play with trucks or something. Set the timer like Christie suggested (thanks Christie!). That way he knows the timer, not his whining, determines when this time ends.There was a period of time when Brayden would have a toy while eating. It was usually a car. He would take a bite and drive it a bit. He was a very clean eater so it didn’t bother me. I have never let Kaitlyn have toys since she is more messy (though I am told cleaner than the average child).If you don’t, I suggest you sit with your son and eat while he eats. My kids both seem to eat more when I am sitting with them eating. I eat breakfast before they do since I am pregnant and need to eat ASAP when I wake up. They eat more if I sit at the table with them while they eat rather than do something like unload the dishwasher.I have mentioned many times about not spanking at all…I am not sure where and when 🙂 I will look around and see if I can find them. My guess is that they would be in a discipline post. Hello from Brussels Belgium – I’ve been enjoying this website from afar, and this is my first question/comment. First, thank you so much for all your work in this blog! It is all so helpful, especially now that I’m overseas and do not have as many people around me to turn to for help! I only wish I had found it earlier! I have been following BW since birth and am a firm believer. Here is my question: My son is now eating solids in a highchair just fine. I don’t give him a toy during feeding but do give one before and after during prep and clean up. He’ll play with it for a few minutes, then he’ll drop the toy – repeatedly. I watch him sometimes and haven’t figured out if he is doing it on purpose or not – he does like to fling his arms a great deal, and sometimes the toy just gets thrown out (this happens both in the highchair as well as during other play). I will pick the toy up and give it back to him, but will also tell him something like “we don’t throw our toys” with a stern look. Is that the most I should do at this age? The only other step would be to take the toy away, I suppose, but I think that comes much later, like around 10 months (as mentioned in your disciplining post). But am I setting myself up by repeatedly giving him the toy back? Thanks so much! sorry, I forgot his age! He’s 7 1/2 months. Thanks again! I am having the hardest time with discipline and my almost 11 month old, specifically with blowing raspberries while eating and drinking his bottle. He does it constantly during the beginning, middle and end of his feedings. I have tried implementing everything BW recommends but it’s not working. Every time I say “no” with a stern look or glare he will do it again right away. I’ve placed my finger on his mouth and he will continue. I’ve turned his high chair around (so as to isolate him in a way) and he continues. I’ve taken him out of the high chair to his crib for a time out and he just continues and plays there and immediately continues when I bring him back. If I let meal time be over he would never eat cause he does it from the beginning! I’m not sure what to do anymore. I have also tried to ignore it and although that seemed to make it diminish, I didn’t want him thinking that was OK either. It’s like he likes my reaction and keeps doing it for that reason. Today he was doing it more than usual, and he would especially do it when I walked away. I would come back tell him “no” sternly, with my finger on his mouth, and as soon as I walked away again, there it was. Maybe, I thought, he was doing it to keep me coming back, but how could I continue walking away when he ignored my rule?I feel like I’m going about this all wrong. He doesn’t respond to any stern looks or tones and I actually think he likes hearing them. What am I doing wrong?? LEM,One thing to remember is to let him surrender with dignity. If he stops when you ignore it, then I would ignore it. If he continues it, I would just take his milk away. He will soon see that he doesn’t get his milk if he does that and the payoff of raspberries will not be worth it for him. 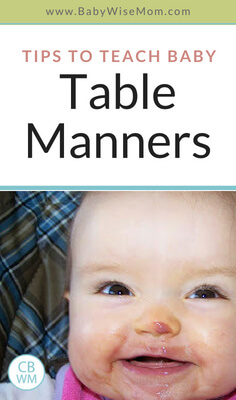 I have a question regarding the high-chair manners section of Babywise II. It makes no reference of how to transition the baby from being fed to feeding himself. I am just beginning to start solids and I approve of the "high-chair manners" from a moral standpoint, but how does a child learn to eat independently? The only thing referenced in the book is giving the child a spoon to play with while not at the table. And furthermore, is the child expected to make this transition at any age without a significant mess? Please offer your thoughts! Becky,You can give your baby finger foods to give your baby opportunity to learn to feed himself. He will definitely get messy as he learns to feed himself. When he gets old enough (anywhere from 12-15 months), he can start feeding himself foods with a spoon. It will be messy, but he will get it. Be sure to look at the other posts on this blog about starting solids, finger foods, and eating with a spoon. Our 8.5 month old son has always seemed fussy at dinner time (since we started solid foods…rice cereal at 5 months). He is now moving on to finger foods/feeding himself some but not all of each meal. Breakfast and Lunch he seems fine 98% of the time, however at dinner time he cries and arches back most of the time. We thought maybe he was just wanting to feed himself, but after a few bites he starts smashing food or cramming it in his hair. He continues to be upset until he is removed from the chair. We have tried meal time over for now but he does the same no matter when he eats. We have tried moving dinner time up thinking maybe he was so hungry he was getting upset. At a loss as to what to try! Any suggestions? Amber, have you tried a bit later of a mealtime?It seems odd he would just get upset. Does he show signs at all before escalating to upset? I just recently tried giving him a small snack with his afternoon bottle, and then his dinner has moved back about 15 minutes. I have seen a little improvement. He usually eats at 6:30 then takes a bath bottle then bed at 7:30. I have noticed if he is eating something dry (ie. cheerios) he doesn't get nearly as upset as if he is feeding himself something slippery (ie. peaches). He really wants to hold the spoon or fork if I have one out to feed him with. I've been helping him feed himself with a spoon some and he loves that. Can you train a 9 month old to eat with utensils?! 🙂 I don't know if it is that he doesn't like his hands yucky or what. My 6 month old could put a fork in his mouth. They can definitely eat with utensils. Although things that can fall off a spoon take a bit longer. Oh and he pretty much starts a little resistance right when he is placed in his highchair at dinner. Then he may seem fine for a little bit, but if I am feeding him cereal he may start to arch his back and start fussing a little. You can definitely let him try feeding himself. I can see that slippery things would be a problem if he wants to be using a spoon or fork himself. He could possibly be someone with a texture issue–and I know some kids have sensory disorders (though I don't know anything about them). So it might be a simple slight sensory dislike (that doesn't need any help) and could be something that needs therapy (occupation therapy I think?). If he just doesn't like eating certain textures as a preference thing, you can work with that. I know Kaitlyn didn't like purees–she preferred chunks of food.But that doesn't mean he does not need to be good at the meal, either. Teach him to sign things or say things like "no" "more" "please" etc. to help communicate in ways other than fits. Hi Val, I've noticed that you appreciate reader feedback, so I'd like to tell you one of the ways your blog has helped me this week. I read this this post quite awhile before I started feeding my 6.5 month old 4 days ago, but the "start as you mean to go theme" stuck in my head re: basic table manners. Day 1: first food, video, super cute, very excited eater wanted to hold the spoon himself, grab for the bowl, put hands all over face, etc. Day 2: I decided to gently use my forearm to prevent his arms from coming up. When he tried to grab the spoon, I would block him and say, "no, arms down please". Day 3: repeat of day 2, with fewer reminders. Day 4: No blocking required, only twice did I have to just touch his arm with my finger, say "no, arms down please", and he complied. Day 5: I didn't have to say it once. He just sat with his arms down or out, but never up, still an eager little guy, just opening up and leaning forward. He was so happy. I feel so proud of our quick progress, and I'm going to start mealtimes with signing tomorrow! Thank you thank you thank you for all that you do with this blog. I know it has made new parenthood even more a joy for me, knowing that I can teach Elijah good behavior from the very start. I love to think about all the effort we save down the road because he is learning to listen, be obedient, and please his parents! Hola, BTW this site has helped us so much throughout the last 7 months!! Our newest challenge is that our 8 month old is refusing to eat babyfood without having the spoon in her hand. We have started from day 1 enforcing the Babywise suggested hands down policy, however she is now rebelling and will cry unless she is allowed to have her hands on or near the spoon/food. It has gotten to the point where she will scream when put into the highchair. She is only happy when given finger foods. This also makes feeding outside the house impossibly messy. I hate to back down and start allowing fingers near the food when we have been enforcing it thus far, but I also don't want her to hate mealtimes and refuse babyfood. Any suggestions? Austyn,Great story thanks for sharing! Good work. Jolie,There are a couple of different routs.One is to give her a spoon to hold, but not let her grab your spoon. Another is to tell her she can't have the spoon and just let her have her fit and calmly wait her out (do something like read a book while she has a fit). just remain calm and she shouldn't find eating a bad experience.You could also try just feeding her finger foods most of the time. Start with that then move to baby food. You could also give her some finger foods to eat while you spoon in baby food. I'm having trouble with this right now (among other things). E will sit, eat well for about the first 4 or 5 bites then he starts pulling food out of his mouth and dropping it on floor. I try telling him no and explaining why but it doesn't seem to be helping. He will also sit well in the high chair for about 10 minutes then he is squirming and can get himself out of the harness. Any tips? Katie how old is he? When he drops food on the floor, I would tell him "that is a no"–or whatever you say when telling him no. If he continued, I would stop the meal, remove the food, and have him take a little time out in his high chair for a minute or two. Then I would try again. Just found my answer in another post of yours : ). Thanks!